Maggy Wassilieff was a writer for Te Ara from 2006 to 2009. With a background in botany, she checked and prepared many entries covering New Zealand trees and plants. 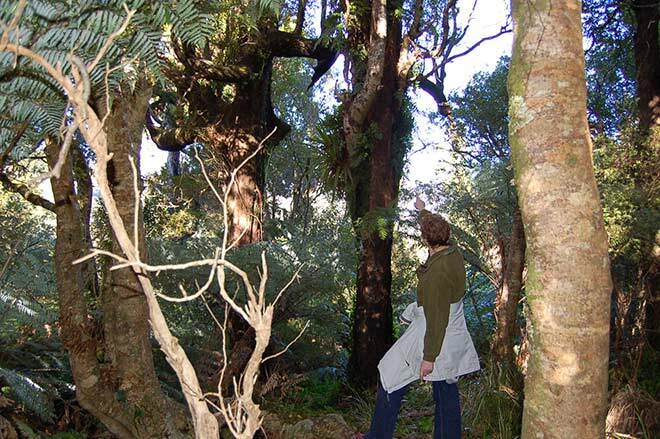 Here she is shown in the bush at Kaitoke, north of Wellington, in 2006. Serendipity is the word that comes to mind when I think of my days at Te Ara. When Te Ara began working on the Settled Landscape theme I took a trip to Gisborne to acquaint myself with this fertile part of the country. I wanted to check out some aspects of Poverty Bay's horticultural industry and have a look at Eastwoodhill arboretum. Although it was a short and uneventful visit in rather inclement weather, something about the place took my fancy. Some years later when the husband began muttering about retirement, I suggested we consider Gisborne as a place to spend our twilight years. Like me, he had no connections to the city and had only driven through it once. But we were over Wellington's gales and paltry summers and Gisborne's climate looked attractive. Now I don't know how much serious thought you should give to undertaking a major change in your life circumstances and how long you should ponder when buying a new property, but 30 minutes is all we needed. So here we are on Kaiti Hill, overlooking the landing site of Polynesian and European explorers. The view is fabulous, the weather is warm, the folks are friendly, and today Wellington is cleaning up after another big storm.